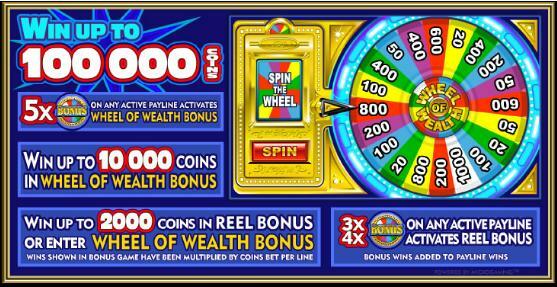 Wheel of Wealth Slot Machine Special Edition offers you 5 reels and 25 lines of pure slot bliss. This video slot is brought to you from our friends at Microgaming. It offers a theme that is classic in overall design and the symbols and background take on the same style. Wheel of Wealth Special Edition is based around the popular Wheel of Wealth 3 reel 1 payline slot. The real attraction to this slot is the bonus game and the chance to spin the bonus wheel. After all who wouldnt enjoy spinning a bonus wheel and watching big wins stack up and fill your pockets with a 10,000 coin payout!. Betting starts at just £0.01 up to £1.00 per pay line. With 25 lines to cover and the ability to double down your bets up to 5x. A Wheel of Wealth maximum bet will set you back £125 per spin. 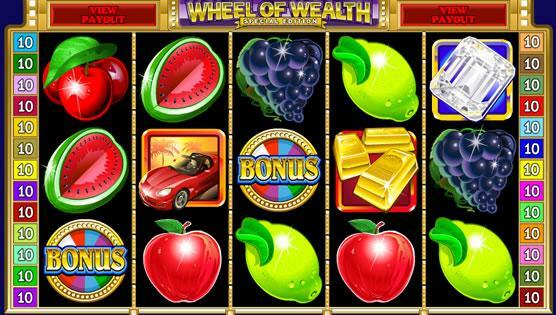 Wheel Of Wealth has some fantastic classic symbols such as apples, oranges, limes, grapes and watermelons. As well as the classic triple bars, a wad of cash, diamonds, a sports car and a private jet. Wheel of Wealth Special Edition also has a scatter which is represented by the Gold Coin. With the wild in represented by the Wheel of Wealth symbol. Wild - The wild symbol is the Wheel of Wealth logo and will complete all wins that are on an active payline, plus it will multiply your win by x2. Reel Bonus - Whenever you see 3x or more of the Wheel of Wealth bonus symbols you will be rewarded with a pick me feature. This can reward you with free coins or a spin on the wheel of wealth bonus wheel. Wheel of Wealth - The main feature bonus however is the Wheel of Wealth itself. When you trigger this feature by getting 5x Wheel of Wealth bonus symbols or by triggering it in the Reel Bonus game, you are taken to the bonus wheel where you will spin the wheel for your chance to win up to 10,000 coins!. 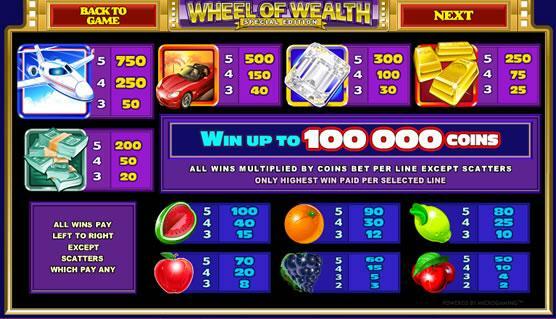 The Wheel Of Wealth Slot Machine is another great addition to the microgaming line up of slot games. If you played the Wheel of Wealth yet then you may wish too as the suspense can be fantastic.